We have a beautiful collection of affordable elegant wedding hairpieces for purchase. The hairpieces are perfect accessory for the bride, bridesmaids, or other special occassions. If you would like to purchase any of the hairpieces below, please send an enquiry to corrine333@hotmail.com. Alternatively, when you book in for your wedding hair trial, you can try the haircombs and decide which would suit best with the hairstyle. 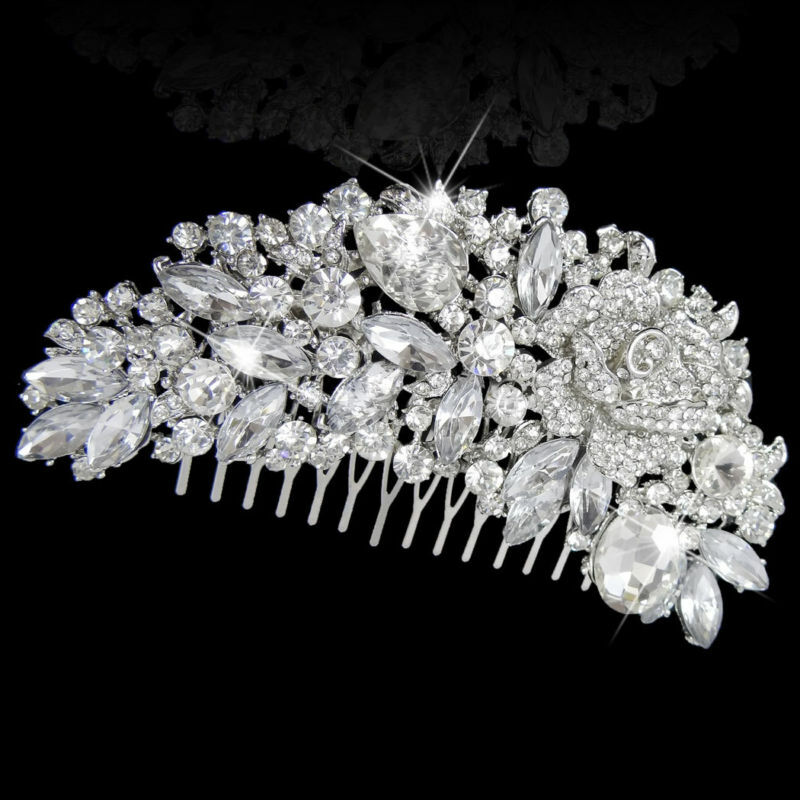 A lovely, elegant Bridal Hair Comb featuring a vintage design made using a very intricate and paved rhinestone crystal. It is encrusted with various shapes from round cut brilliant stones, baguettes to marquise shaped. The sparkle on this hairpiece is unbelievable and will sure to make a statement on your special day! This gorgeous middle-sized haircomb is perfect for the bride in a range of different hairstyles including updo or half down with curls. It will also be suitable for the bridesmaids or for any special occasions. This hairpiece comes beautifully packaged in a box. 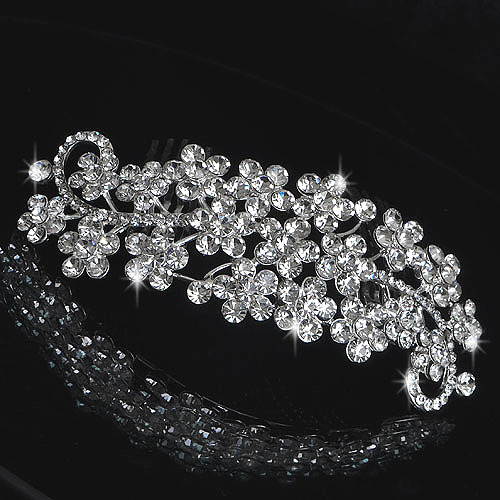 An exquisite larger sized bridal haircomb with a classic design encrusted with sparkling crystals and pearls. 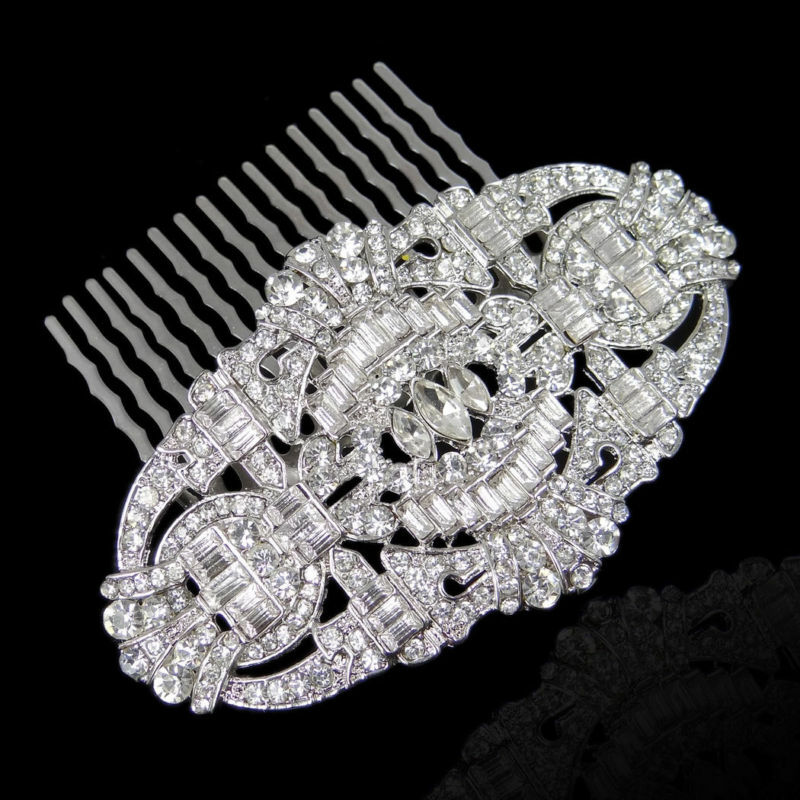 Sophisticated and elegant, this haircomb will look great as a side accent to an updo hairstyle or downstyles with curls. 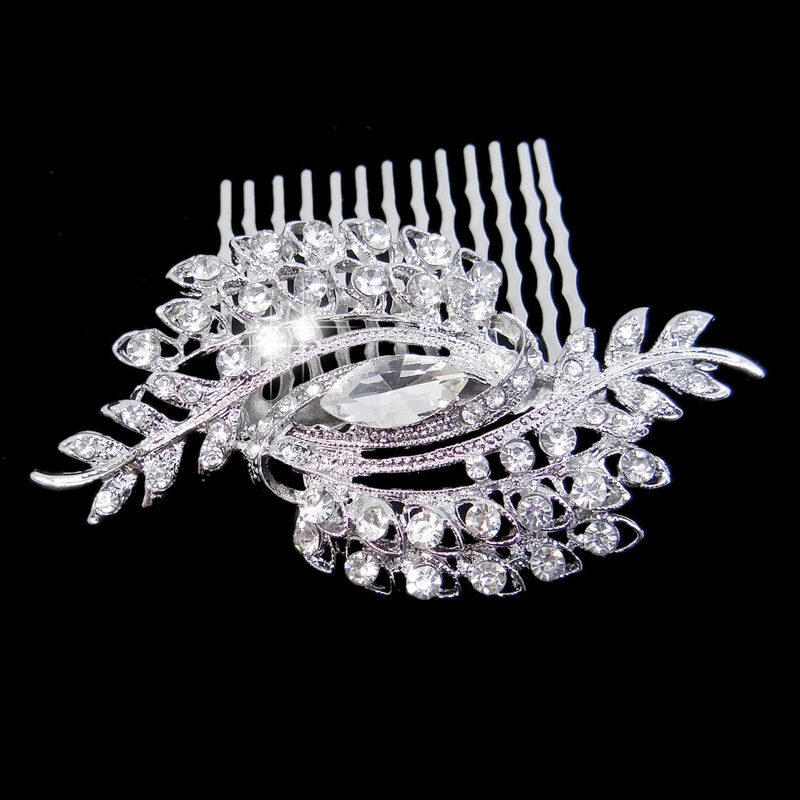 A beautiful, elegant Bridal Hair Comb featuring rhinestone crystals in a vintage design. It is Rhodium plated to prevent tarnishing. This gorgeous smaller-sized haircomb is perfect for the bride in a range of different hairstyles including updo or half down with curls. It will also be suitable for the bridesmaids or for any special occasions. This hairpiece comes beautifully packaged in a box. A beautiful hairpiece comprising of sparkly , high quality rhinestone with pearls in a gorgeous floral design. Approx measurement: 6.5cm x 4.5cm. 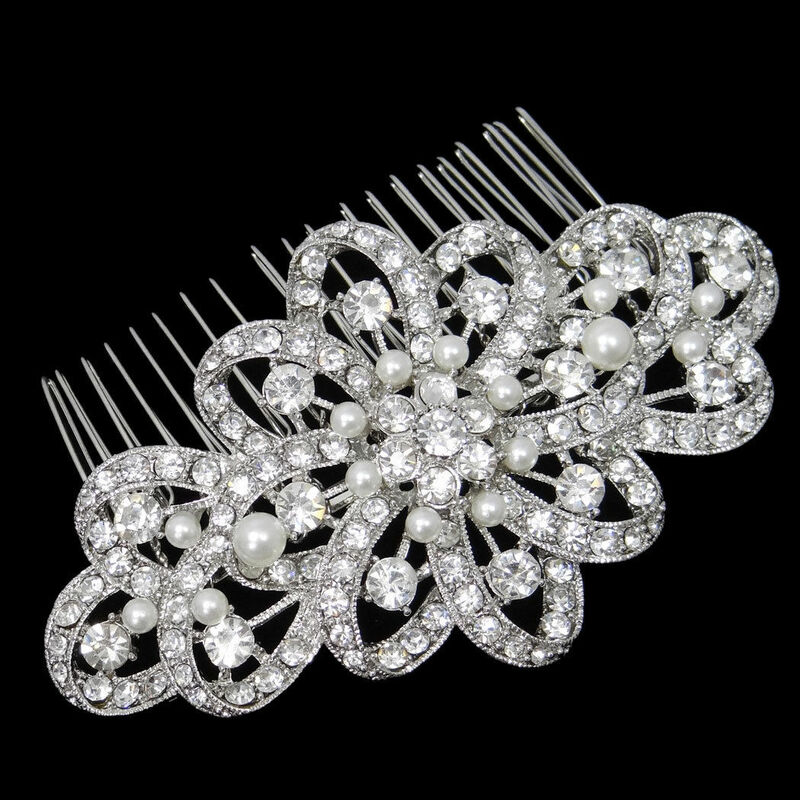 This is a beautiful vintage style comb featuring a floral design comprised of crystals and pearls .There are 10 beautiful pearls on this hairpiece. This elegant piece is perfect for any bridal style and is also suitable for bridesmaids. Approx measurement: 8cm x 5.5cm. This is a larger sized lovely bridal haircomb which features an assortment of round stones worked into a floral arrangement. The comb works nicely when placed both horizontally or vertically and suits both updos or downstyles. A beautiful medium sized hair accessory that will suit the bride or bridesmaids. This stunning haircomb is comprised of a floral and leaf arrangement with various sized crystals. A larger sized bridal haircomb with a striking ,unique floral design. The sparkly crystals embedded all around the hairpiece creates an elegant look with any hairstyles.